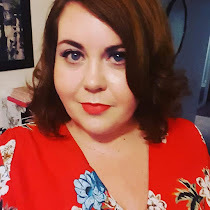 I was recently contacted by the lovely Stef of +Bonmarche and asked if I would like to review something from their new in range. With an eye on the approaching Summer I chose the Ethnic Print Tab Front Jersey Dress which is priced at £29.50. I really love the print on this dress and the colour of black, pink and cream works well. The dress is comfortable to wear and bang on with sizing. I have gone quite simply with the styling of a statement necklace and some sandals from +Dorothy Perkins (last season). I am looking forward to trying out different looks with the dress too, such as toughing up the look with a leather jacket and ankle boots or really going out there with lots of accessories. I can see this dress being a great go to for the upcoming Spring/Summer as it can easily be dressed up for the evening or thrown on for a wander around the park in the afternoon (yes I get dressed up for the park too). Check out the New In section as they have some great pieces for the Summer. * This item has been gifted to me however all opinions are my own. I need some new Shoes to go with these trousers . That dress looks amazing on you!